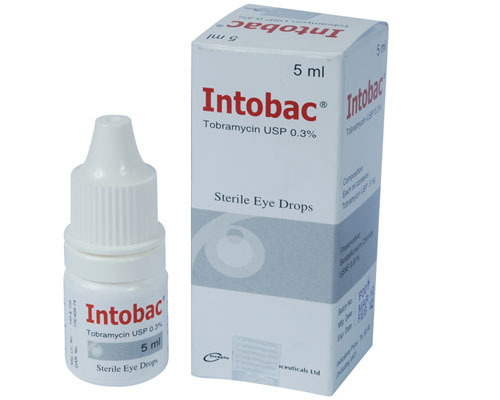 Intobac 0.3% eye drops: Each ml contains Tobramycin USP 3 mg.
Intobac is a broad-spectrum, aminoglycoside antibiotic of bacteriocidal type of action. It works by inhibition of bacterial protein synthesis by binding to the 30S subunit of the bacterial ribosome. Streptococcus sp. of group A beta-hemolytic and some nonhemolytic species. Escherichia coli, Pseudomonas aeruginosa, Enterobacter aerogenes, Klebsiella sp., Proteus mirabillis, Proteus vulgaris, Haemophilus influenzae, Morganella morganii, some strains of Neisseria, Acinetobacter calcoaceticus, Providentia, Serratia, Salmonella sp. Adults: If the infection is mild to moderate, 1 or 2 drops into the affected eye(s) every 4 hours. In severe infections, 2 drops into the eye(s) every hour until there is improvement ,following which treatment should be reduced prior to discontinuation. Pediatric Use: Safety and effectiveness in pediatric patients below the age of 2 months has not been established. Pregnancy Category B. Reproduction studies in three types of animals at doses up to thirty-three times the normal human systemic dose have revealed no evidence of impaired fertility or harm to the fetus due to tobramycin. There are, however, no adequate and well-controlled studies in pregnant women. Because animal studies are not always predictive of human response, this drug should be used during pregnancy only if clearly needed.